Peter Mayhew, the actor who played Chewbacca, is almost 7' 3" tall, and because of his size (and possibly his age) he has some trouble getting around. He walks with a cane (it's designed to look like a "lightsaber") and when he travels, for example to make appearances at conventions and charity events, he needs a wheelchair to get around the airport. 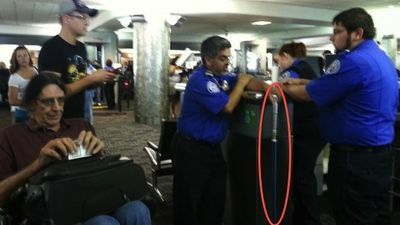 None of this stops him, but there is one force in the universe that can delay him: the TSA. Last week, Mayhew—who is on Twitter at @TheWookieRoars—tweeted this picture of himself at a checkpoint at Denver International Airport waiting while two members of the elite legion that guards America from disaster stand around waiting for a better trained supervisor to come over and help them examine a cane. Or did they think it was a dangerous lightsaber? Here's the deal, guys—it's either a cane, or a FICTIONAL WEAPON. Wait—possible third option: it potentially could have been a cane with an old-school metal sword hidden inside it, in which case maybe the guy in the WHEELCHAIR would try to hack his way through the cockpit door with it. Was that the theory? Please. The TSA claimed later that it was the "unusual weight" of the cane that required supervisor intervention. As Mayhew also tweeted, "Giant man need giant cane" was the fairly obvious explanation for that one. If these guys wanted a picture of themselves with Chewbacca and his lightsaber that they could put up on the wall and admire when they go home to their moms' basements, I'm sure all they had to do is ask.